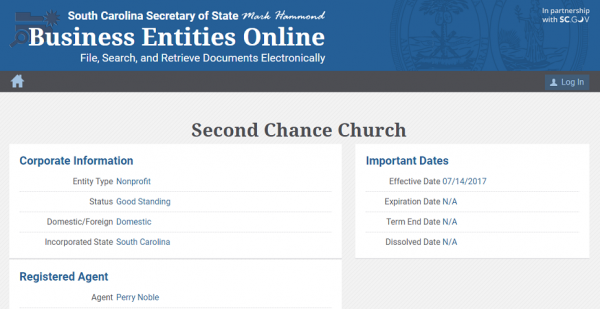 According to a filing with the South Carolina Secretary of State on 7/14/17, Perry Noble incorporated the Second Chance Church as a religious organization in South Carolina. The incorporation papers are routine for a church except that this church only requires three board members and they do not have to live within South Carolina. At the end of July, Noble posted a reflection after a year of being in recovery. He described a bit about his experience since going into rehabilitation in Tucson, AZ. Curiously, he did not mention his wife or former church. Concerning his status with his former church NewSpring, he doesn’t seem to be getting a second chance there. 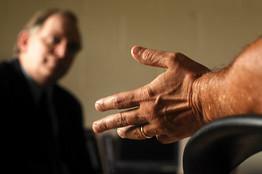 The feud blew up into a public debate recently between the church and Noble. Noble accused the church of misrepresenting him and the church leadership said they had attempted to support Noble’s recovery. No doubt, his return to more formal ministry will reignite conversation about how soon is too soon to return to vocational ministry after being forced to leave it. There is at least one other Second Chance Church in the U.S. There is no obvious connection between the two entities. Possible first sermon series in the new church: Get Back Up! John Walker has been my therapist for around seven years now and I hold him in highest regard. In those seven years I’ve allowed him to speak into me; however, I am now humbly submitting myself to him and giving him authority over me as I believe he will serve as my pastor, my psychologist and my spiritual formations director in this next season. Perry Noble is back and ready to help you. He is busy tweeting, recording podcasts, and launching his consulting service – The Growth Co. at www.iwantmychurchtogrow.com. He also has a business consulting wing at www.iwantmybusinesstogrow.com. Looks like he is going all John Maxwell on us. Last we saw Noble (September of 2016), he had “gone dark” on social media and was submitting to his psychologist/pastor/mentor while dealing with personal issues. Just prior to his brief absence from the public eye, Noble was relieved of his duties as founding pastor at NewSpring Church. The last quote confuses me. If Jesus is going to build His church, then why do I need Perry Noble to do it? I suspect Noble and any number of other consultants could help me build a bigger religious business with more customers and a bigger budget. What I don’t understand is why I need Noble to help build the entity that Jesus is already building. Author Warren ThrockmortonPosted on January 5, 2017 Categories Perry NobleTags Growth Co., Perry NobleLeave a comment on Perry Noble is Back!